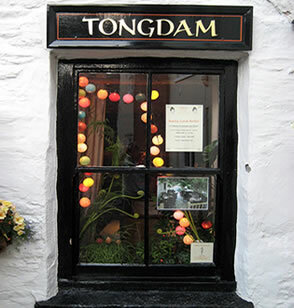 Our Restaurant is located in Dulverton, a beautiful small town, known as the gateway to Exmoor. You will find no more charming a place than Dulverton, bordered by the River Barle and steeped in local history. This old Somerset town has been the centre for those interested in walking, shooting and fishing for generations. Tongdam Thai Restaurant opened its doors in May 2005. Originally a row of cottages dating back 200 years, the buildings were converted into the first restaurant in the early 1980’s, going by the name of Crispins, and run by John and June Day. After retiring to France in the late 80’s, June returned to Dulverton and has become one of our closest friends and greatest supporters. Our ‘friendly ghosts’ as we refer to the atmosphere at Tongdam, will greet you as you walk through the entrance. You will enter our first of two dining rooms, with seating for 20 and our Bar. The rear dining room seats a further 20, with both rooms filled with reminders of the Far East of yesteryear. During the summer months and when the weather permits, we have a walled decking area on two levels that seats a further 20 and over which, is a wonderful old grape vine, wisteria, and jasmine, all of which are illuminated with light clusters and up-lighting, offering a magical atmosphere.